Superheroes, etc. : Prediction/Theory RE: Civil War, The Inhumans, and S.H.I.E.L.D. Prediction/Theory RE: Civil War, The Inhumans, and S.H.I.E.L.D. So, Marvel announced its Phase 3 plans today. No Hulk movie. Not going to focus on that though, that's a rant for another day. Basically, I just wanted to air a bit of a theory/prediction regarding one of the most interesting titles in the list Marvel released. Namely, Captain America: Civil War scheduled for early May 2016. For those who may not know, Marvel's Civil War event involved two factions of super-heroes fighting over government registration that would force all super-heroes to reveal their identities to S.H.I.E.L.D., and become federal employees rather than vigilantes. Iron Man led the pro-registration side, while Cap was at the head of the rebels. There were some pretty strong hints that Marvel was laying the foundation for a future Civil War event in the Marvel Cinematic Universe in Avengers. There's Maria Hill's silent "yeah, whatever" reaction to Fury at the end of the film when he says if the Avengers are needed they'll come back "because we'll need them to." 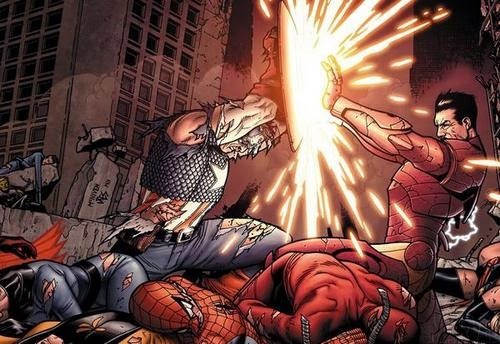 And more than anything there was the instant rivalry between Captain America and Iron Man. The thing that's kept me scratching my head about this is that there just aren't enough heroes. How can you have a cinematic Civil War with only a dozen or so heroes from which to choose? Even if you throw in the characters from the upcoming Netflix shows and the C-listers popping up on Agents of S.H.I.E.L.D., you're never going to get the right numbers. And even if Marvel keeps pumping out at least two movies a year for the next 10 years, you're still not going to have the right numbers. I'm thinking Agents of S.H.I.E.L.D. might be in the process of changing that. Okay, going to try to be succinct with this. Let's see how I do. So Phil Coulson, Agent of S.H.I.E.L.D., was murdered in Avengers by Loki. He was brought back to life and in Agents of S.H.I.E.L.D. 's first season it was revealed he was resurrected when he was injected with alien DNA. The alien in question had blue skin. One Marvel alien race with blue skin is the Kree. You saw them in Guardians of the Galaxy. Ronan was a Kree. 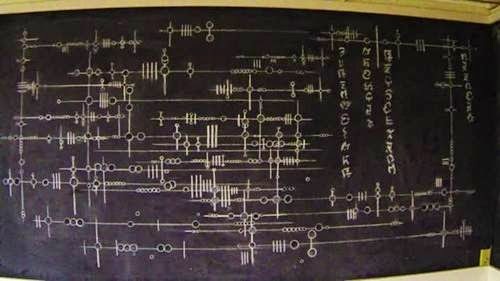 Later in Agents of S.H.I.E.L.D., Bill Paxton's character John Garrett was injected with the same DNA and he started drawing a bunch of crazy symbols (pictured above). After Garrett's death, Coulson started doing the same and he's continued to do it in Season 2. In one of the most recent episodes, it was revealed that Hydra has been poisoning somewhat random groups of civilians with something that has been killing them, but Hydra is always disappointed when it kills them. They seem to want something else to happen. There are a lot of hints that they are trying to create people with super powers. In the Marvel Comics Universe, the Kree are responsible for the creation of the Inhumans, humans with super powers. They used something called the Terrigen mists to change early humans into the Inhumans. In a recent Marvel event called Inhumanity, the Terrigen whatever was released on Earth, and any humans with even the faintest Inhuman ancestry were given super powers. So, my prediction/theory: Something like the Inhumanity event is going to happen on Agents of S.H.I.E.L.D. And suddenly the world is going to have a lot more people with superpowers. Like, a lot. Hundreds at least. This will cause confusion and chaos, and this will create the circumstances necessary for Civil War. This may even be how Marvel solves the mutant problem; as in the problem that they can't use mutants in their movies because Fox owns the movie rights to X-Men. This may be how they explain how Quicksilver and Scarlet Witch get their powers. It would be fitting too, since Quicksilver has close ties to the Inhumans. So that's my theory. And if I end up being right, I have proof that I thunked it.